I’m from Dublin. I was born, bred and buttered here as they say, raised on the north side just a couple of miles from the city centre so being in Dublin is just… being home. You’ll have to forgive my romantic, soppy and sometimes rose tinted view of our nations capital for most of my memories in life were made here, both good ones and bad, I’m a Dub through and true, in fact 7 years living abroad only made me love home even more. Coming home to visit family is great. But coming home to visit family in your campervan is a million times greater. We have our own room (no need to include us in the guest list Mammy!) and our own stuff right there with us. Our bedroom, bathroom and kitchen to wake up slowly and imbibe the necessary caffeine before socialization in, if that’s the way you operate in the morning you’ll understand how important that is. Spending a few days on the driveway of the parental abode, affectionately known as #109, is fantastic as we have a homebase on the north of the city and can see the family and explore in little hops. Obviously Dublin is not new to us, but Dublin in a campervan still is, and we’re having fun finding so many varied places to mark on our map of overnight stops. The entire east coast of Ireland from Belfast to Wexford is rather heavily populated and finding local and still wild and beautiful parkups has been a little more challenging than the west coast but also really rewarding and it gives me a chance to take Dixie, and William, for a drive down memory lane. I’ve been writing forever, ever since I can remember, stories, plays and especially diaries and poems. I read incessantly and surrounded myself with literature for a living in various bookstores, independent and chain, for 12 years or so. I even have the un-noteable accomplishment of a half finished novel under my belt (or, under my bed is much more accurate, I don’t actually own a belt) but I had not thought about nevermind written about life in a van before now. 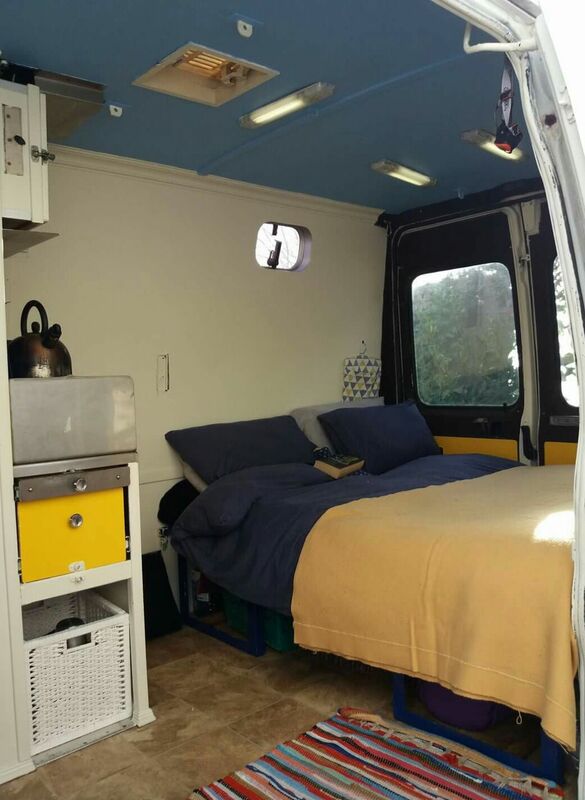 Yet here I am, writing a regular sort of van life blog. It still sounds strange to me now, even 11 months later, it still looks strange written down. Who lives in a van? Thats just … weird. Dublin isn’t just about the city, although it is very much about the city, the lights, the crowds, the traffic, crossing the dark Liffey over the wrought iron Ha’penny Bridge, winding around College Green and up cobbled Grafton St. to the grassy haven of St. Stephen’s Green, an oasis of garden in the slate grey city expanse. Dublin is live music, friends, pubs, family, Dublin is walking for miles, bundled up in layers against the crisp weather, and its sometimes hard to think about without welling up. I’m not going to advise you to eat at this certain cafe or restaurant or to pay to see this attraction or stay in any particular hotel or drink in any one pub, just go to Dublin. Go, walk around, look at the buildings, watch the people, follow them aimlessly if you have time and get lost, feel the heave and throb of the crowded streets on a busy Saturday night, then, return to walk some more on a Sunday morning when the pavements are deserted for another view entirely. When you want to escape the city and get some peace without venturing too far, Dublin provides that too, there are many scenic and quiet spots within a short drive. One of Dublins 3 estuaries, Broadmeadows is a special place full of memories, mainly of a teenage me as the dark road makes a fantastic location for a little anti-social behaviour but more recently of protecting myself and my young daughter from marauding gangs of large, aggressive swans. Dixie ambled the short 17 minutes or so from #109 in the early evening and arrived at Broadmeadows just as the sun was setting behind the trees. Given the busy M1 runs right alongside the river a stones throw from here there is a constant dull background hum of traffic, like a fuzzy feedback from a black and white tv in the corner, and the nature reserves proximity to Dublin airport means every take off and landing is loudly announced and easily spotted, though noticeably loud at first, road noise usually peters out after peak hours and is easy to tune out when you try. The river is home to the afore mentioned angry Mute swans in their sanctuary with hundreds of breeding pairs of the beautiful and majestic and terrifying creatures. Ireland has over 9,000 Mute swans and that number is only growing. They’re sociable too as they will they quickly approach your vehicle but turn your back on them and they’d nick your wallet and maybe try to break your arm. Don’t say we didn’t warn you! We are not suggesting you sleep overnight at the estuary, parking is extremely tight and only in a layby but as it happened there was little sleep to be had the night we visited anyway. At around 2am William took the torch to the window for a routine “outdoor check” (the estuary is tidal afterall, and the narrow road low and likely to flood) and was greeted by the sight of a huge flock of little bats, hundreds of them, raining down from the trees Dixie was nestled under. A strange black shadowy cloud swooping and moving and diving, feeding on the unsuspecting insects on the still water. We watched mesmorised as the bats fed together for a few hours until the crowd gradually thinned out and the light showed signs of returning to the day with a silver sliver on the waters surface. Just an hour later the birds, ducks and swans took their usual dawn places on the river again. Bats are much quieter than water birds, stealthier, nocturnal and a little creepy, they seem really smart. We read Irish bats dont hiberbate in caves and the number counters are flummoxed as to where it is they do rest. Bats are protected by law so we reported our sight immediately. We’ve never seen bats in such numbers before, if you want to see some of Irelands 9 species in action, this is the place! To some, this blog might read a little like travel writing. We love to see a new place, take all the photos we can, learn all we can, experience it, go back to Dixie and talk… Its only when we leave that I think about writing up where we have been. That’s why we try to group sights together and to visit ‘regions’ (however vague we imagine them), to put some sort of order onto the places we have been and seen and more importantly, to mark out what land is left unexplored in between. In fact, back in Scotland I refused to cross the bridge from Fife into Dundee to buy butane as I would rather have a physical border like a river or bridge seperate our travels into neat chapters for us, we’d not been to Dundee and I’d rather leave it at that as I am well aware of what will happen when we do, we will find a hundred reasons to stay there and we were needed south a week later. What makes writing a blog like this different is that we don’t visit a region, leave and go home like a lot of travellers and travel writers would do. I might write a much more comprehensive review of our stopover and our experiences if we did, especially given a little hindsight. Instead we go on immediatly to another new place, often really close the last place, often doubling back on previously travelled routes and I sometimes muddle all the places up together. I barely know my Lancaster from my Lancashire as a result and often the blog posts lack a certain location-based specificity, which I believe might be the very point of a travel blog, to be about somewhere. Anywhere at all really, just somewhere. Howth is another great spot just outside Dublin city and most Dubs have fond childhood memories of trips to Howth to eat icecream cones, climb Howth Head for a panoramic view and stroll along the harbour to watch the colourful little boats bobbing in the water. I’m no exception, I love Howth, more so now that we can park there and stay there. Howth means the smell of the sea, thick cut salty chips served in newspapers and devoured while sat on a wall, shooing away seagulls with your feet. Although the summit carpark (the one at the very top with the best view) has a height restriction barrier in place, there are a few other options on the approach to the hill, keep your eyes open and be prepared to do a couple of laps of the head in search of a flat, free place to park. Patience paid off for us, we slept safely and soundly and woke to another beautiful view. I update our facebook page every evening, writing about where we have been and what we have seen and any other happenings or goings on in the van. We save these WordPress blogs for longer, more specific posts, keenly respectful of our email subscribers and anxious not to fill any inboxes with inane ramblings or to end up repeating ourselves. We don’t need to waste time or space giving you coordinates or directions to the places we have been or guesstimate how long we think it’ll take you to explore these places, I have no doubt most of you are reading this for possible vanning location ideas, not for exact itineraries. No doubt you’re better at this than we are already and if you want to visit any of these places you’ll look at your own map and devise your own plan. I’ll save some of those words instead for that half finished novel. Bray is the quintessential seaside resort for many on the east coast of Ireland and in its hayday saw thousands of holidaymakers descend upon the little town and swarm the long promenades busy souvenir and rock candy shops for long summer months, not so much anymore as many of the tourist amusement arcades are shuttered up these days. By far the best part of Bray for me is the short hike up to the cross on top of Bray Head, I couldn’t count how many times I’ve climbed that rock. We had family for company on our trip to Bray last week and the nephews chose the 5km cliff top walk from Bray to Greystones instead of the climb, another fantastic route. The walk is well signposted and accessible if you don’t fancy mountaineering either and at the end of the trail you can get the train back to Bray. As for parking in Bray, again the best views are height restricted and the promenade is Pay-and-Display but if you look closely you’ll find a few mysteriously meter-exempt spaces right near the hill and your morning view might be rather loud and colourful like ours but it will be free. Everybody loves a carousel! It might not be a popular opinion, but it is mine: Dublin is best enjoyed in the rain. Walking the city under heavy grey cloud, feeling the reliable droplets fall on your face, again it might be emphasised by my lengthy absense, self exiled on a semi-tropical island, but I do love Irish rain. Ever present, ever falling and ever wet Irish rain. The entire country is crying out for precipitation as this drought presses on through midsummer and the heat continues to stifle us folk in vans who wish for rain to drop the temperature, to water the grass and refill the rivers, to scare away the crowds of insects and sometimes, the crowds of people too. Vanners seem to follow the same path south every year, the Run to the Sun some call it, but the thought just does not appeal to us. Give me Dublin in a thunderstorm any day. I think rain inspires me, although surely I should have a couple of finished novels under my bed in that case? Dalkey Quarry had somehow previously escaped my attention so I for one am very glad we recently chose to visit. Here is a rare case of new memories only! Unsure of our options for parking we happened upon a very cool, very retro looking VW camper pootling along ahead of us in traffic and for the first time ever I said Follow That Van, and jokingly we did, and what do you know, 2 minutes and 2 right turns later and Dixie slid in behind them to an amazing spot on the coast with views of Bray, Killiney Beach, the Sugarloaf and everything in between. The beach carpark is height restricted but hug the coast road a little further around and you’ll find the long row of free parking spaces, look in the park for toilets and bins and thank that VW for the tip! The walk around Dalkey quarry leads through tall brown grass and pretty wildflowers to a dark path between the huge clifftops of chiseled rock and it was almost empty the day we visited, save for the brave unharnessed climbers we watched scale the sheer rock faces effortlessly, unused hooks and picks and carabenas jangling on their belts and echoing around the enormous stone space. Killiney Hill park, right next to the quarry, is another gem, an ancient little woodland on a green grassy hill overlooking the city and Dublin Bay. Huge old trees line the park but between them a handful of weird and cool old follies stand, we spent a great afternoon getting lost in the woods and playing around the sculptures. Here is William climbing one of them, the Pyramid of Dublin, built in 1852. This larger one below is called Killiney Obelisk, built in 1742 by landlord John Malpas to provide employment to poor locals after 2 particularly hard winters and a record-breaking wet summer caused crops to fail nationwide, an event also known as Ireland’s Forgotten Famine. The park was busy enough when we visited, around the monuments at least, although step back into the woods and off the beaten track to enjoy your flask of coffee and your dose of forest solitude. In a city of around 2 million individuals, it is still possible to be alone in the woods. Killiney Hill offers the best views of Dublin we’ve ever seen and on a clear day you can see right across to Wales. Stay up there for sunset, you won’t be disappointed. Back at Dixie but not ready to finish the days adventures yet, we followed the path across the railway bridge and down to the slope to Killiney beach instead. The greenest of algae clings to the rocks exposed at low tide, a colour almost too bright, too fluorescent for nature. Further up the beach huge rockfalls have created little caves and crevices in the stone wall. We could have kept walking right back to Bray. I guess just like making memories (and my poor, ignored novel) visiting Dublin is never going to be finished. It’s never going to end. Whether in Dixie, on foot, by bus or train I’m never going to write my final word on visiting my beautiful home. Everytime I return to Dublin I find we’ve both changed, we’re both a little older and we’ve seen a little more. The city moves and changes and beats like a pulse. James Joyce said that when he died, Dublin would be written in his heart. I know exactly what he meant. Wow…I need to visit there someday!!!! Great info, thank you. Fantastic guide to Dublin!! Well done!! Debbie does Dallas and now Dixie does Dublin! Great pun!